(…) when the world is full of autumn muskiness and crisp, tangy perfection and the air so clear that you feel as if you could reach out and ping it with a finger. Even the colors were crisp: vivid blue sky, deep green fields, leaves in every sharp shade that nature can bestow. It is a truly astounding sight when every tree in a forest becomes individual; where formerly had sprawled a seamless cloak of green there now stood a million bright colors. On David’s birthday (28th) he got to set the pace for the day. We started with breakfast and presents. He got two long sleeved smartwool microweave t-shirts that he wanted badly after having bought one a couple of days ago. David is very particular with fabrics – he’ll only wear certain kinds and they have to fit him in a certain way. Dane is exactly the same, it’s funny, but makes it hell to shop with them. He also got some Red Sox paraphernalia, a reading light and a book about autumn in New England. And for dinner David had lobster – his favourite food. It’s still the lobster season here, so we saw the little lobster boats going out by the hundreds and in every bay you can see the little buoys telling of the lobster trap beyond and you can see the traps stacked in front of every other house out on the peninsulas. While writing this, we were at a place called Land’s End in an area called the Harpswells – it’s on the very tip of one of a hundred peninsulas in this part of Maine. From here, all you can see are the tips of other peninsulas and the Atlantic – glittering in the sun. 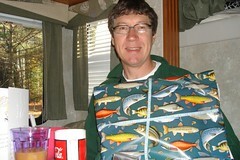 You’ve guessed it already; David and Dane were fishing while I sat inside the RV on the sunny side writing this. Even if I’ve got my life’s first classy outdoor wear, I still find it too cold to just stand about. I’d much rather go for a brisk walk. 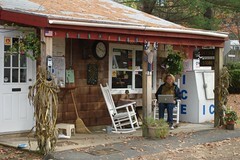 Me on the Internet – only place at Maine campground where it was accessible. 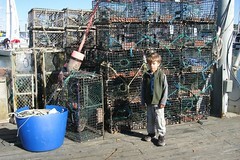 And Dane in front of lobster traps. 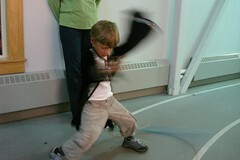 We went to a Halloween party at the local YMCA. It was very well done. The entertainment was excellent, the games fun and for everyone, the costumes funny and many of them very inventive. And the parents were all very nice and the children generally very well behaved. There was a haunted house so scary that Dane wouldn’t even go through it together with me. Actually, it was pretty scary! Very well done. 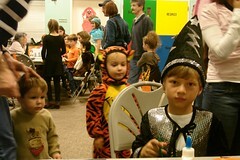 Dane looked great in his wizard outfit with a magic wand and pointy hat. But the thing that he wanted the most was to meet other children and play with them. And we had no luck with that, unfortunately. So it wasn’t the success we’d hoped for.